One of the fathers of the German environmental movement, Prof. Fritz Vahrenholt, comments on models, Friday school strikes and the environmental destruction by green energies. Over 80(!) authors, led by Jean Christophe Golaz of Lawrence Livermore National Laboratory, have recently developed a new climate model (produced for the upcoming IPCC 6th Assessment Report). While so far the models have been parameterized on the basis of a period of pronounced warming (mostly between 1976 and 2005), the current work of Golaz et al (2019) takes a different approach: the pre-industrial conditions around 1850 were taken as the starting point. The evolution of global surface temperatures in observations ( blue, green, grey) and in models ( red). Source: Fig. 23 from Golaz et al. (2019). The paper also explains how this happens: The aerosols (they cool by shading the solar radiation) have far too great an effect in the model and the climate sensitivity to greenhouse gases is also clearly too high. Björn Stevens of the Max Planck Institute for Meteorology Hamburg (MPI) also addresses the problem that models compensate too high a sensitivity to greenhouse gases by too much (negative) aerosol forcing. 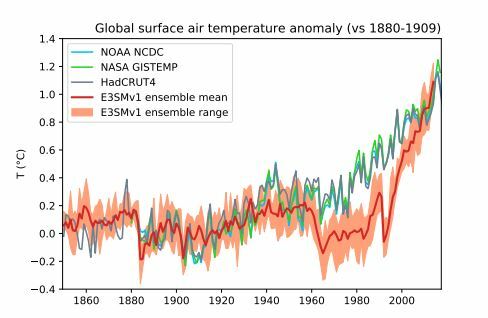 It seems to be a fundamental problem of all models that do not sufficiently take natural variability into account and want to explain temperature development solely by anthropogenic influences. In the end, Golaz et al. (2019) comes to the conclusion that both the (negative) aerosol propulsion and climate sensitivity to greenhouse gases (especially CO2) must be reduced in models in order to simulate the recent past from 1960 onwards with the necessary precision. For the declared purpose (the development of scenarios up to 2100 – i.e. the next 80 years), even the latest “sophisticated” models turn out to be unsuitable. They predict a catastrophic development because of faulty modeling that has little to do with the reality of the last 50 years. Greta and her German followers derive their demands for an immediate end to our lifestyle from this very false model world. In fact, climate researchers who are familiar with the unreliability of climate models should steer the children’s crusade to a sensible direction, for example with reference to the contribution by Jochem Marotzke, who recently came to the conclusion in Spiegel that “our remaining CO2 budget for the 1.5 degree target is probably at least twice as large as we thought it would be“. Yet the very same Marotzke now supports the Fridays for Future demands for a short-term coal phase-out in Germany by 2030, bot in China where the annual CO2 increase is about as high as Germany’s total emissions. And Marotzke is assisted by climate researchers Claussen, Schellnhuber, Rahmstorf, Latif, Mosbrugger, Stocker and Anders Levermann (this is the one who claimed in the scientific committee of the German Bundestag that CO2 is an angled molecule and therefore a greenhouse gas). He probably missed too many chemistry classes on Friday as well. The number of wind turbines is to be doubled to tripled in the course of the Energiewende [transition to green energies] energy revolution, one wind turbine every 2.7 km. But now there are new warnings about the environmental impact. According to a DLR model analysis carried out at the end of 2018, flying insects (e.g. the admiral, ladybirds) seek high rapid air currents shortly before laying their eggs in order to be carried by the wind to distant breeding sites. The currents are above 60 -100 m and hit a rotor area of 200 million m². An air throughput of 10 million km³, which is more than ten times the German airspace (up to 200 m height), will be sucked in by the rotors. 1200 tons of insects will be destroyed by the rotors, which is 1200 billion insects. One of the authors estimates that this corresponds to the size of the insects destroyed by 40 million cars. Remarkably, the decline of flying insects and the expansion of wind turbines over a total height of 100 m to 200 m coincided 15 years ago. Coincidence? We do not know. “Shut down wind turbines from April to October”! The scientists demand a shut down the wind turbines from April to October at temperatures above 10°C. For our parliamentarians in the German Bundestag: The Federal Agency for Nature Conservation has so far rejected an investigation. Ronald Reagan would say to Angela Merkel,”Ms. Merkel, tear down these turbines,” as he would stand in the presence of the colossal man-made mistake and point his finger at all of them. Instant blight where once was pristine landscape. When you add fixed air to a beverage or water and bottle it, you are sequestering carbon dioxide. An absurd project would be to bottle carbonated water in two litre bottles by the millions and never open them. You would be sequestering plastic too. The solution to the problem of the carbon dioxide gas increased concentration in the atmosphere is to bottle soda water until the cows come home and never open them, ever. Ban bicarbonate of soda and yeast too. Sounds crazy and it is, but it could work. Something has to be done to eliminate all of the sturm und drang. Just a humorous musing, nothing else. as useless as older models ! Fake models vs fake temp records = fake science. Completely uninteresting. But politically and economically it’s terrifying how a few determined activists can use fraudulent “science” to undermine functional infrastructure and get it replaced with drek. The turbines and PV arrays will be a worthless “monument to man (Michael Mann)” by 2050. I seem to recall Senator Ted Kennedy’s comment to the proposed offshore turbine farm near Boston, USA; “Not In My Back Yard” aka “NIMBY”. My theory is that the whole idea of GC, GW is bogus. And, yes, the climate changes and it has from the beginning of life on Earth. The warmist/greenies even call their agenda “social, racial, economic and environ-mental (pun intended) justice. I say we put their ideology on the back burner (again, pun intended) until at least 2030 to witness the actual situation. Regards, retired engineer, physicist, astronomer and petroleum geologist (1970-2017), A REAL SCIENTIST. Copy it. They will eventually erase it.